Taylor Congleton grew up on the water, in South Hero, Vermont—an island in the midst of Lake Champlain, tucked quietly away between upstate New York and the Quebec border. Nowadays he raises three majestic hound dogs who occasionally inspect his work. On the weekends he sails a hydrofoil catamaran painted with Flying Tigers livery, a tribute to his World War II veteran grandfather. He has the tasteful trappings of Range Rover life. And within the cramped blue walls of a 1,600 square-foot shop in nearby Colchester, a few hundred feet from the boat dock at Mallets Bay, Congleton builds some of the most stunning Range Rover Classics in the world. What Congleton Service does to classic Range Rovers is what Singer does to Porsche 911s, or what ICON has accomplished for FJ40 Land Cruisers: nothing short of a complete reimagining, limitless unto insanity. Each Congleton Certified Range Rover takes a year to complete. The base price is $185,000. You supply your own Range Rover, but only if it passes Congleton’s unerring gaze. He aims to build three or four per year, and he is booked up for the next three years. Intricacies abound. In 1995 Land Rover gave the classic Range Rover one last gasp of modernism, putting millions of pounds toward redesigning the interior, updating the wiring harness, and upgrading the drivetrain. A year later, it was replaced anyway. Among the one-year-only peculiarities includes a plastic center gauge surround that is impossible to find intact: “we’ve bought entire cars to have this piece,” Congleton told me. So he spent five years reproducing it. Underneath the Range Rover’s rear window are two plastic tabs that resemble devil’s horns for lifting up the heavy steel tailgate—they are always broken. Rare parts like the ABS module, stuff that’s on “galactic backorder,” as he puts it, are disassembled, sandblasted, powdercoated, and reinstalled. A British-born electrical engineer on staff rebuilds the multiple control units which manage everything from the air suspension to the transmission—20 years old and made by Lucas, a name that will strike fear into the heart of any professional mechanic today. The aluminum-block V8 is torn down, balanced, ceramic-coated, flow-tested and bored out to 5.0 liters. Along the way it receives forged internals, a one-piece crankshaft, custom-profile cam, reprogrammed ECU, top-hat cylinder liners (replacing a notorious factory issue that leads to blown head gaskets), and a custom aluminum radiator. The result is between 300 and 330 horsepower—double that of a stock Range Rover. Most every supplier Congleton deals with is based in Vermont, a state long an enclave of craftsmen. Inside, leather is supplied by a concours-level shop, to whatever a customer’s heart desires: the example on hand, Congleton Certified No. 3, featured custom navy blue carpets, a leather-wrapped dashboard and steering wheel, and stock seats reupholstered in white with blue piping and stitching from a P38-generation Range Rover—the one that replaced the Classic. Then, he was going to college and working in construction. But the big brick-like Rover was what held his interest: in a cramped condo garage, barely a foot of space on either side, he wrenched through freezing Vermont winters, knowing that on a Range Rover something will always be broken. He threw entire paychecks at Rovers North, a parts supplier in nearby Westford. Eventually the company’s owner persuaded him: thanks for spending all that money here—but what if you made money on Land Rovers instead? So Congleton began to work for Rovers North, absorbing the ins and outs of the Range Rover Classic. Six years later he set out on his own. He believed that he had cracked the code. He has been building Range Rover Classics to this exacting standard for three years now; it was only last year when he introduced the Congleton Certified label, to give his efforts more gravitas: numbered plaques, certificates of authenticity, the whole show. The details. The most surprising thing about driving an old/new Range Rover Classic is just how much taller you sit than any modern SUV. Perched up on a high chair, you are lord of all you survey. Why not crush something underneath your three-spoke wheels? Smell that fresh Connolly leather, as pristine as it will ever be. Both shifters are wrapped in leather and inset with wood. The carpets are plush. An understated Sony Bluetooth radio looks like it belongs. The gauge cluster surround is present and accounted for. Even the transfer case warning sticker had been carefully reproduced. This example, with its custom navy/white interior, is about to be delivered to a gentleman collector in Colorado. It also costs—well, I’ve already mentioned how much it costs. It was pothole season in Vermont, the snowplows tearing away giant chunks of asphalt, until the scars left behind could swallow my Fiat. Despite riding atop two giant solid beam axles, the Rover remained well-composed, hardly any shaking, little body roll. Steering was like a tippy boat in a squall: more a suggestion than a direct order. But with the high-riding visibility, where you could see clear across the hood to the other corner, the effect was a vehicle that felt somehow both small and vast at the same time—shrinking around you the faster you went. It was a blustery, overcast day, and the world was all shades of blue and grey. We drove to the boat dock. Someone had plowed a thin layer of snow from the top of the ice. Congleton tiptoed all two tons of new/old Range Rover down the concrete ramp, over a blue-grey puddle, and onto the frozen surface. The ice groaned. Needless to say, ripping four-wheel-drive donuts is difficult. 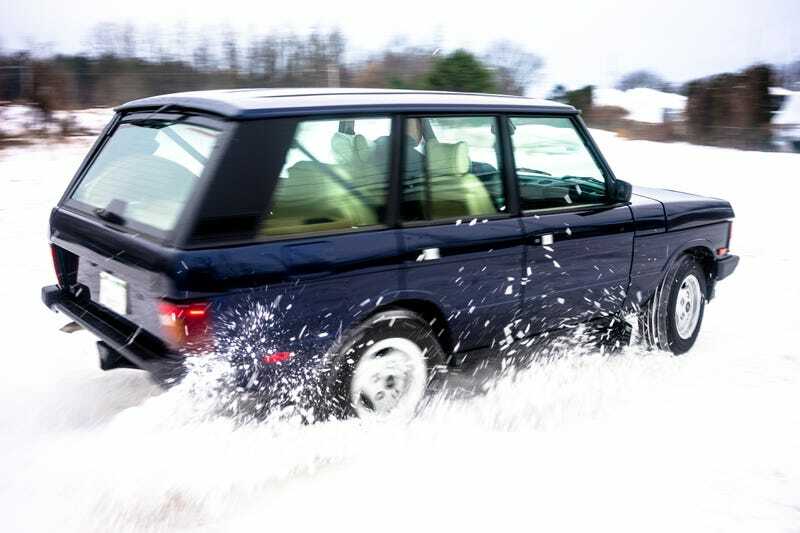 On a regular Range Rover Classic, it would have been nearly impossible. But 300 HP sideways makes for great photos, none of which I’ve been able to take. When we returned to the shop Congleton threw me the keys to an example from 1994, one that had been refurbished to a fine standard, but not the whole works. Try it out, he said, smiling, you’ll notice the difference before you even leave the driveway. Through no lack of effort on the company’s part, we are led to believe that the Range Rover has always been sophisticated, aristocratic—if it’s good enough for the Queen, it’s gotta be pretty nice, right? Surprise upon surprise: what a beast it was, with a balky shifter, shakes and rattles galore, more noise than forward momentum. With just 150 horsepower new, and 120 remaining by Congleton’s estimate, getting to just 30 miles per hour was a chore. The beast rolled, shaking over every single bump. It protested with every input. The Range Rover debuted in 1970 and lasted a quarter-century. Did they change anything during that time? Perhaps nothing. Perhaps they didn’t need to. Before the SUV became a domestic beast, before we expected our SUVs to do everything well, they didn’t need to be civilized, or perhaps, they were civilized enough. What Congleton has done with so much effort is to preserve the charms of the old one—great sound, vague trucklike steering and handling, a sense of fearlessness—and give it the comfort and reliability it probably never had in the first place. It is a steep price to pay for something that feels 25 years older than what we’re used to, instead of 50. What price for style, then? For Congleton’s discriminating clients, price is no object. In 1994, the entirety of Rover Group was purchased by BMW, with Land Rover its gleaming gem. In those Radwood-worthy days, SUVs were in the midst of a popularity explosion, transitioning from rain-slicked British countryside to American cul-de-sacs. After 25 years the original Range Rover—now officially called the Classic—ended. It was the first time a Land Rover model went out of production. The message was clear: every subsequent generation of Range Rover was better in every measurable way. Except for the one part where they weren’t.